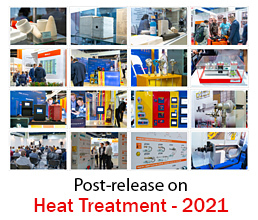 The feature equipment and materials from leading world and domestic manufacturers of thermal and chemical-thermal equipment, refractory materials, thermal insulation, measuring, diagnostic and analytical equipment will be presented at the exhibition «Heat Treatment - 2019». In 2017 110 companies from 10 countries presented their equipment and technologies at exhibition, the total area was 3022 sq.m. Read more about the last Exhibition. An important part of the exhibition is a 12th International practical-research conference “Innovation Technologies of Heat Treatment” traditionally carried out in its framework. The conference in the framework of the exhibition quite improves the efficiency of work of the exponents and of the visitors at the exhibition. The conference carries a maximum of innovational information and favours the professional experience exchange as well as the interconnection between science and manufacturing. - presentation of the new technologies and equipment. Equipped exposition space 360 / sq.m. Unequipped exposition space 325 / sq.m. Power supply for the equipped area up to 1,5 kW 19 / sq.m. 6 sq.m. 9 sq.m. 12 sq.m. 15 sq.m. To get free invitation ticket and become a listener you just need to register. Please, note! The applications for participation are accepted until August 10, 2018. The exponent information is put in the catalogue in Russian and in English. The exponent has ½ of the A5 format page for description in English. At the same time the exhibitor presents the company logo that is put for free. The filled in forms should be sent in Word, faxed or PDF documents are not accepted. Please, note! The filled in forms are accepted until August 10, 2018. Only the names and contact details of the companies who will not provide the information until that moment will be put in the catalogue based on their application forms for participation in the exhibition.